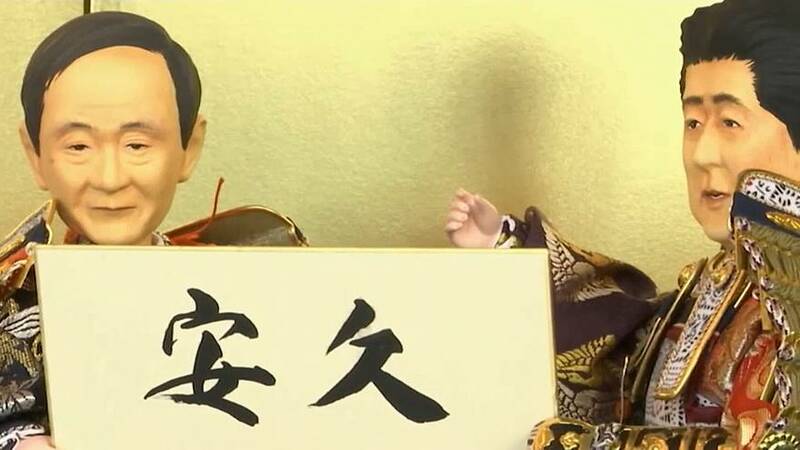 A Japanese doll maker has unveiled dolls modelled on Japanese Prime Minister Shinzo Abe and chief cabinet secretary Yoshihide Suga. The dolls are holding names suggested by the public for a new era, ahead of the abdication of Emperor Akihito. Japan's traditional calendar uses era names tied to the reign of each emperor. Abe and Suga's lookalike dolls are created in the style of the Gogatsu Ningyo – dolls which are displayed for a boys' festival held in May to wish for their healthy growth. Dressed in colourful, traditional armour, they went on display in Tokyo on Thursday at the showroom of famous doll maker Kyugetsu Co. The company's spokesman, Hisatoshi Yokoyama, said: "Gogatsu Ningyo [are] a kind of amulet to protect the person from evil. [They] represent people's wish to keep away the negative, so as to pave a way to a good world and life. So in these dolls, we deliver our message to wish for the new era to become a good one." So far, "Ankyu" – meaning peaceful and everlasting – is the most popular choice for the new era name. The winning suggestion is expected to be announced – by Suga or Abe – on April 1, before the abdication of Emperor Akihito at the end of that month.